As South African President Jacob Zuma leaves office, we look at how the controversies around him have influenced the way South Africans express themselves. Here are our top 10 phrases which have become part of the vocabulary since President Zuma became ANC leader in December 2007. The Collins dictionary defines this as "the efforts of a small number of firms (or such actors as the military, ethnic groups, and kleptocratic politicians) to use the state to their advantage through illicit, non-transparent provision of private gains to public officials." In South Africa, it specifically refers to the allegation that one wealthy family - the Guptas - has bought its way into the most influential organs of state, via the president and his family. For example, former Deputy Finance Minister Mcebisi Jonas said he was offered a bribe of 600m Rand ($45m; £34m) by one of the Gupta brothers, Ajay, in order to accept a promotion to finance minster, in exchange for removing key Treasury officials from their posts and advancing the family's "business ambitions". Mr Jonas also alleged that President Zuma's son Duduzane, a business partner of the Guptas, was present at the meeting. Ajay Gupta denied the meeting took place, and the family has denied all wrongdoing. President Zuma and his son have also denied all corruption allegations. The phrase was named 2017's Word of the Year by the Pan South African Language Board, a statutory body which promotes the country's official languages. "We are happy with the choice as it echoes a year dominated by highly-charged political and social discourse," its chief executive Mpho Monareng said. "I wouldn't be surprised if state capture becomes one of the defining words of our time," he added. 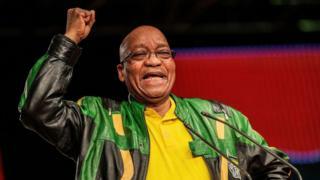 Popularised by the opposition Economic Freedom Fighters (EFF), Zupta is a blend of President Zuma's surname, and that of the Gupta brothers ( Ajay, Atul and Rajesh). The merging of the two names suggests an improperly close relationship, with their interests so intertwined that they are one, although both families deny this suggestion. This term is used to describe the dominant role or unfair advantage that white-owned businesses have in the South African economy, to the detriment of the black majority. More than 20 years after the end of the racist system of apartheid, white South Africans still earn around a five times more than what their black counterparts do. The redistribution of agricultural land taken from black people whilst the country was under white rule has been painfully slow. And about 95% of the country's assets are in the hands of 10% of the population. But the phrase has become synonymous with murky goings on in government, after a now-notorious campaign by UK-based PR firm Bell Pottinger on behalf of the Gupta-owned firm Oakbay. The PR agency was accused of operating fake twitter accounts in a racially driven campaign against critics of the Guptas, President Zuma and his family. It was alleged to have used the term to target President Zuma's opponents, accusing them of being agents of "White Monopoly Capital" - in other words, representing the interests of white people. Bell Pottinger was ejected from the UK's public relations trade body when the scandal came to light, and soon afterwards went into administration as some of its top clients abandoned it. When South Africans talk about "transformation", they mean correcting the inequalities created when the country was under white minority rule. The term "radical" emphasises the need to accelerate the process of putting economic power in the hands of black people, and land redistribution. Whilst it has been official ANC policy since 2012, it is alleged that Bell Pottinger deliberately pushed the term to suggest that the scandal-hit president was under attack from "White Monopoly Capital" because he wanted to bring about "Radical Economic Transformation", and Mr Zuma's critics were, in this way, painted as being less committed to tackling the past injustices against black people. The term should not to be confused with Nkandla, the president's private home which was at the centre of controversy over a multi-million dollar taxpayer-funded upgrade, including the building of a swimming pool which officials described as a "fire pool" in a desperate attempt to justify it as security-related expenditure. Nkaaandla, said with a nasal intonation, is a word to ridicule people who appear to be fixated about corruption allegations against President Zuma. It came into being when the president mocked the way opposition leader Mmusi Maimane pronounced the name of his rural homestead. It is now used to imply that or refer to a person who has "sold out". Both are terms used in parliamentary procedure. The former is used to draw attention to a rules violation, the latter to address other MPs. However, they have become synonymous with rowdy behaviour in parliament, the disruption of proceedings, and interrupting the president whilst speaking. The opposition EFF say Mr Zuma should have resigned, and have frequently interrupted parliament. It has led to fights in parliament, and EFF MPs being forcibly removed. Both terms are now used in any kind of rowdy conversation. For example, if people are having a debate over a couple of beers, you might shout "point of order!" until the other person shuts up. Or if your opponent makes a point that seems below the belt, you might cry "honourable member!" and then proceed to talk over him or her. The word "nyana" is a diminutive conjunction in the Sesotho language, meaning "very small". When combined with the English word "small" it loosely translates to "tiny-little" skeletons. The phrase came into use when Social Development Minister Bathabile Dlamini, herself the subject of much controversy, said that all of the ANC's leadership have "smallanyana skeletons" in their closets. She warned about "hanging dirty linen outside", a reference to ANC leaders who had gone to the media to air complaints. She said that if they were all to "take out" each others "skeletons" then "all hell would break loose". The subtext? There is no-one clean in this game, and people in glass houses shouldn't throw stones. This is a verb, meaning to change one's mind abruptly. It takes its name from the ANC secretary-general Gwede Mantashe, who has been accused of doing several u-turns. Following a controversial cabinet reshuffle in March, Mr Mantashe appeared to question Mr Zuma's leadership, saying the way ministers were hired and fired was "unacceptable". Days later he seemed to have changed his mind, saying the ANC accepted the president's reasoning. This is a phrase and Twitter hashtag meaning "must go" or "must come down". It first came into use during the #RhodesMustFall campaign by students at the University of Cape Town to bring down a statue of colonialist Cecil Rhodes. Then there was the #FeesMustFall movement, by students campaigning for university fees to be scrapped. Later came the #ZumaMustFall and #ZuptaMustFall movements, in response to the growing corruption allegations against the president. Now it can be used to refer to pretty much anything you do not like, for example "this traffic must fall" or "homework must fall". It is also frequently used on social media, with #MondaysMustFall being a common hashtag. Pronounced as cha-cha-ragh, it means "to be forward, over-eager, over-excitable, and/or annoying". It is an old word which had something of a revival in popularity, after an encounter between then-ANC youth leader Julius Malema and BBC journalist Jonah Fisher. Mr Malema took exception to a comment from Mr Fisher at a press conference, and accused him of being tjatjarag. Mr Malema then had Mr Fisher removed. The incident occurred in 2010, when Mr Malema was still very much a strong supporter of the president. Mr Malema was kicked out of the ANC after falling out with Mr Zuma, and is now the leader of the EFF. These days if someone was being slightly rowdy or cheeky, one might say in a tongue-in-cheek way "don't be tjatjatrag", or "you are being tjatjatrag" It also describes behaviour that is likely to get you kicked out of a room.